I woke up early the day we were catching the train and we left our house around 8:00AM to arrive at Union Station around 9:00AM. We had received our tickets through the mail and we would be the second people in line for the Sleepers check-in section at Union Station. Around 9:40AM, the conductors began giving people boarding passes. After we received ours, we were given the option to wait inside of the station or go out on the platform. I elected to go out to the platform so I could video record the train arriving. 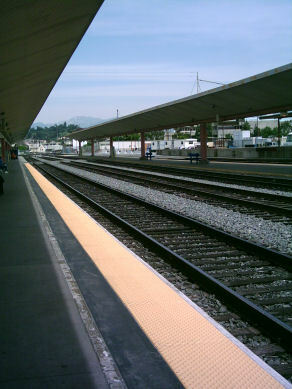 The platform had only one other person on it when we first got there, and there was no train on track #10. In about 10 minutes, more people had checked in and there were about 30 of us waiting for the starlight to pull in. As we waited, more and more people entered platform #10 waiting for the Coast Stalright to arrive on the tracks. 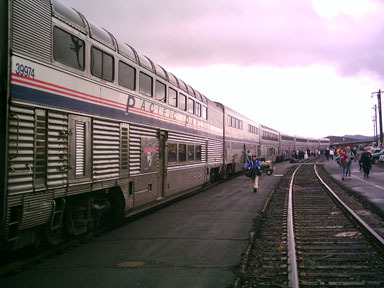 One of those people was the Coast Starlight Chief on On-board services. 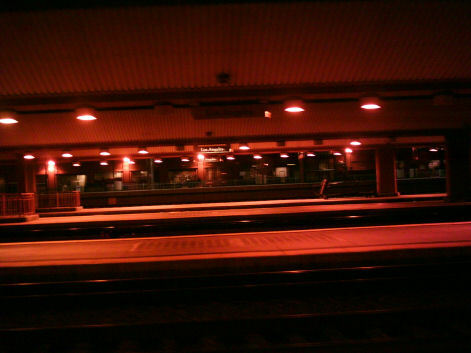 About an hour after checking in and getting on the platform, there was no train to be seen. We waited, and waited and waited some more. People kept thinking that the train was coming in as a metrolink commuter train went on another track. 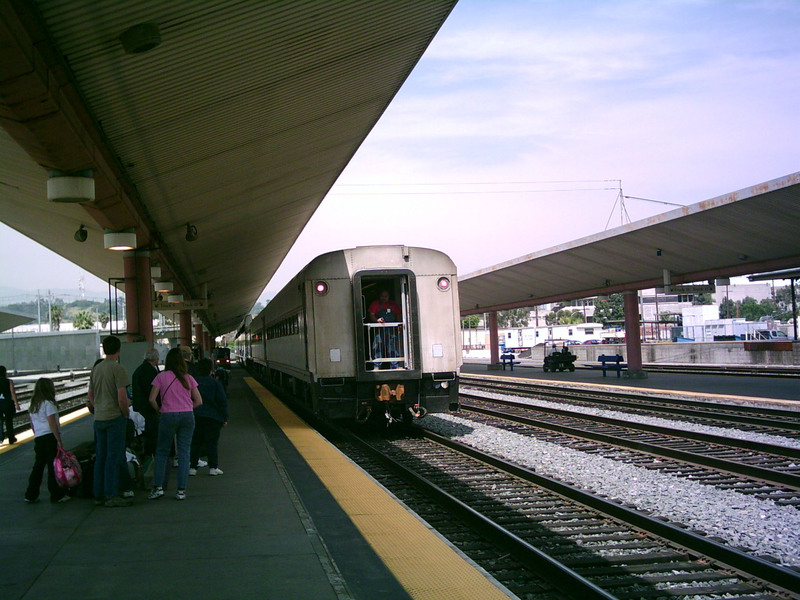 There were several other Surflienrs, Metrolink, as well as the Metro Gold line commuting in and out of Los Angeles Union Station. Here are a few pictures including one of 464 which is a re-painted surfliner that was involved in an accident with a truck at a crossing earlier this year. 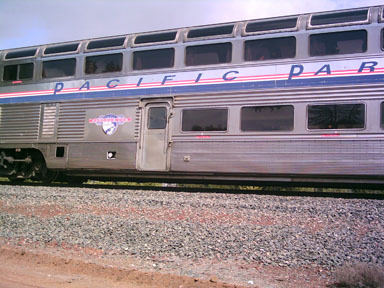 It went to Beech Grove and came back with a slightly different colors then the regular Surfliner colors. It was now about 12:00PM and I was pretty much just sitting around taking pictures and listening to my iPod. 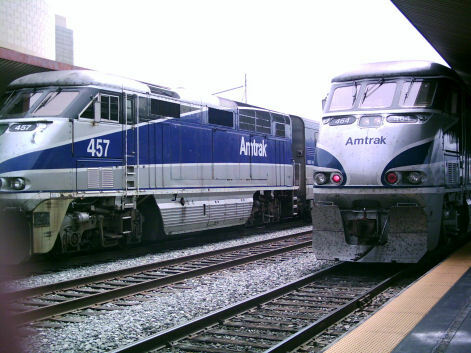 Finally, a little after 1:00PM The Coast Starlight arrived into Los Angeles Union Station. It had two Horizon cars with the new paint on, and a bagage car hooked on the back. I got a video and picture of this. Enjoy! We were the first ones to board Car #31 (32095 "Nebraska") our attendant would be Joe Washington. We were in roomette #10 just as we had been in our trip last year. I left my backpack with in the room and immediately walked to the Parlour car for the 1pm continental breakfast. 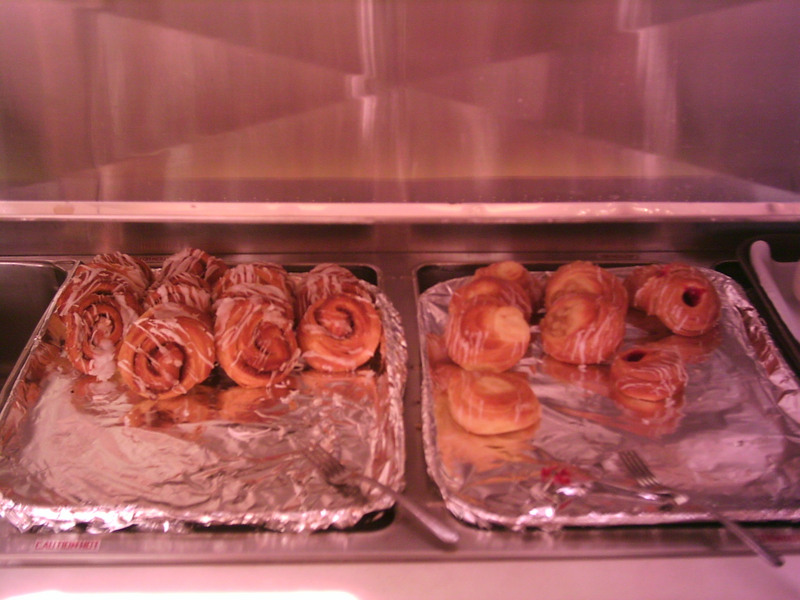 I had purposely not ate much that morning in preparation for the delicious pastries onboard. I ate 2 or 3 muffins in the parlour car, after that a lot of people were asking what time lunch would be served since it was already suppose to have started IF we were running on time. Our Pacific Parlour Car attendant Theresa notified us that the LSA in the diner would be making an announcement shortly. After about 15 minutes in our room, we heard the announcement for lunch service in the diner. When we got to the dining car, it was already about half full, and we were lucky not to be put on the waiting list. Our seating companions were a nice couple heading up to Oakland for a weekend in Northern California, then flying back in a few days. 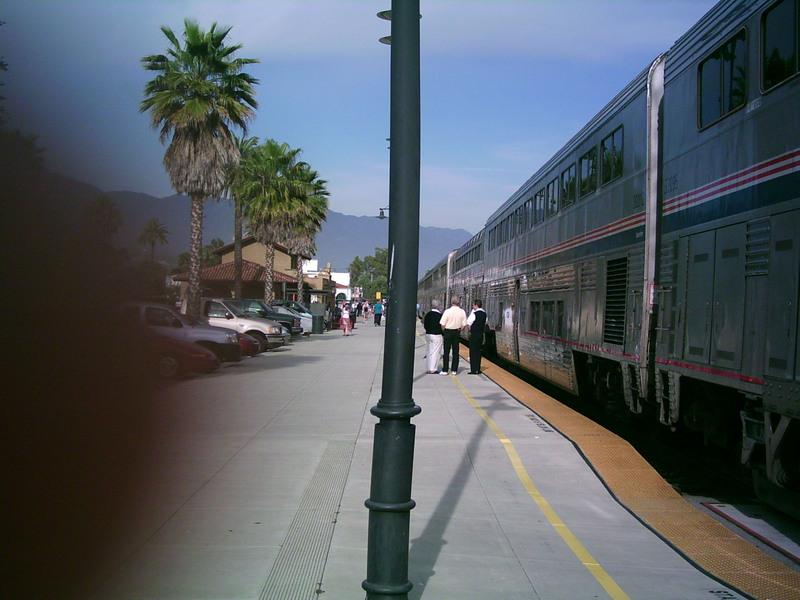 This was there first time on the Starlight, but they had traveled to San Luis Obispo (SLO) a few weeks before on the Surfliner and enjoyed that trip very much. 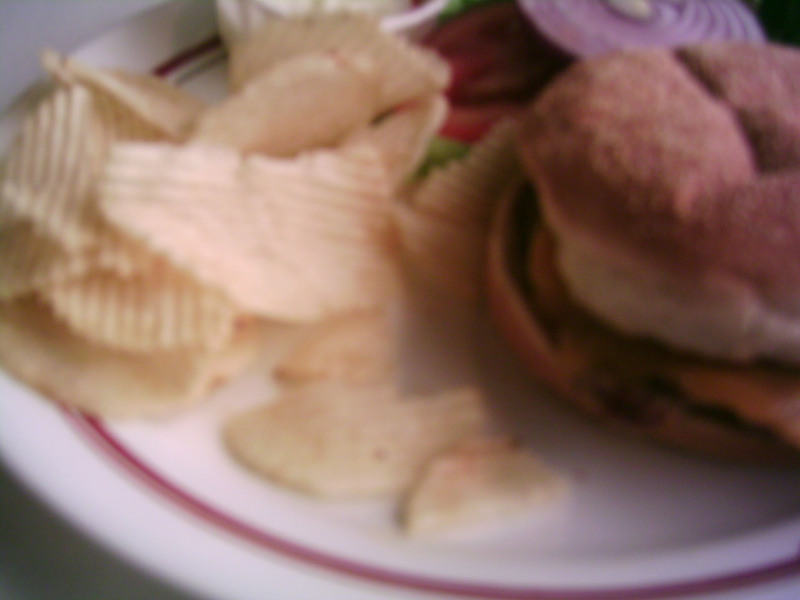 Our server was Tom, I ordered the Angus Burger with potato chips as I always do for lunch. My mom did the same, Ben and his wife ordered the chicken sandwich with cheese. 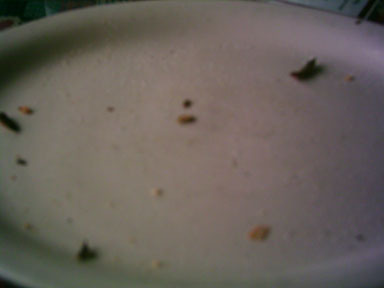 Our food arrived in less then 10 minutes and it was off my plate in less then 5. For dessert I decided to have the cheesecake with strawberry topping. 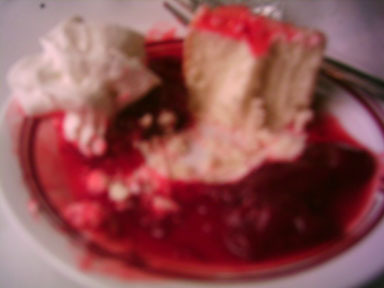 I am a rather big fan of the cheesecake on Amtrak. After lunch, we were in the middle of SImi Valley and Oxnard, and stopped for about 20 minutes waiting for a southbound train. About 10 minutes after that, we were in Oxnard. 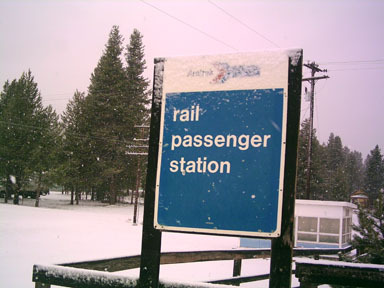 We did a double-stop there which I did not remember frommy past Coast Starlight trips. 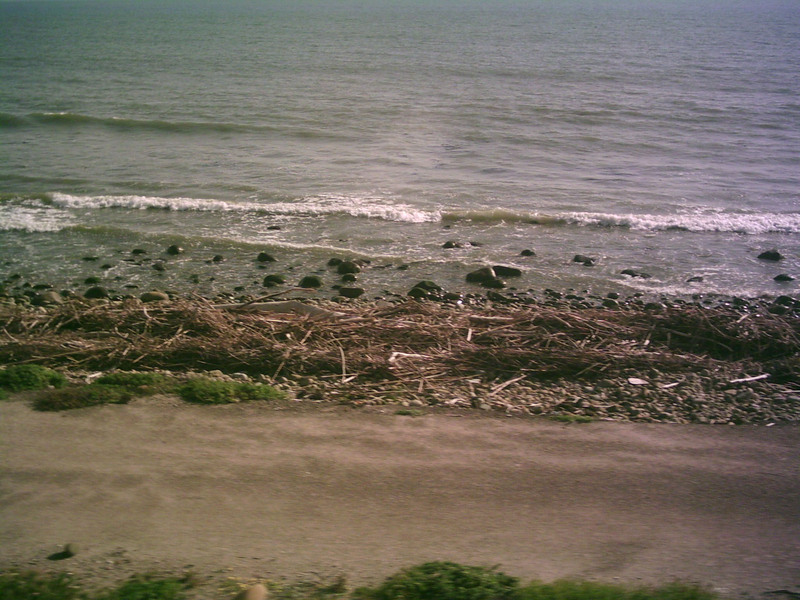 After departing Oxnard we began to get away from the "backyard" scenery and began to see the beautiful pacific coast. 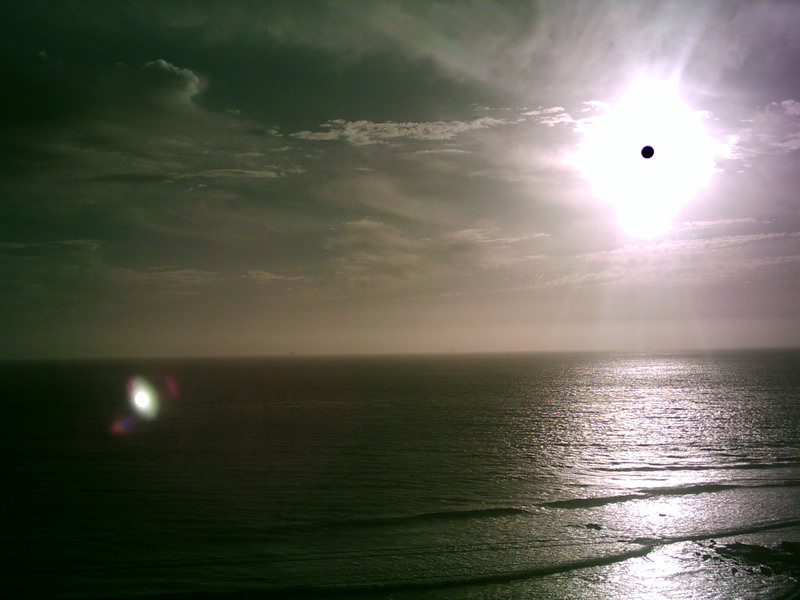 Notice that the sun is going down on the ocean because we are running so late! At about 4:03PM I saw Montecito so I knew it would not be more then 15 minutes to SBA. 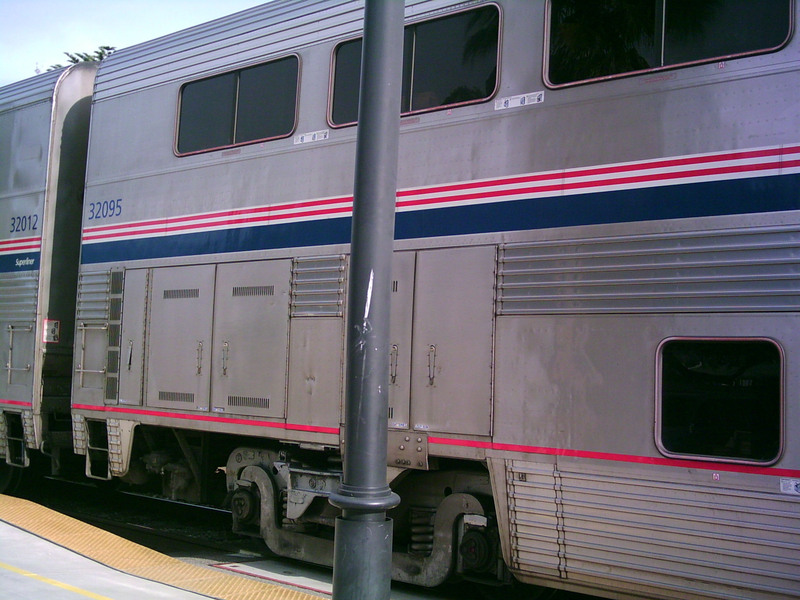 When we got to Santa Barbara, I took some pictures of the train and I also got the numbers of the consist. The "All Aboard" came about 20 minutes after we arrived and we were off to San Luis Obispo. We would hopefully not lose any additional time getting to SLO. 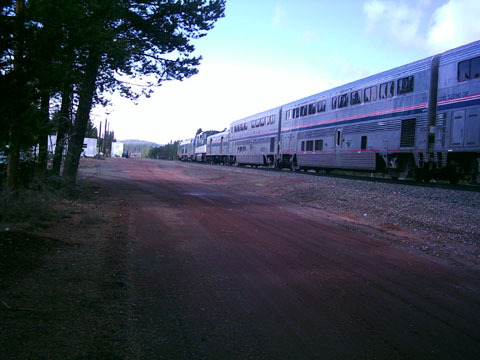 When we were boarding the train, I talked to Joe for a bit and I asked him about some other Amtrak crew members and he actually new Cruz, our attendant from my trip last year on the Starlight. He said that he had worked with Cruz when Cruz did not have his seniority so he had not yet been assigned to Crew #4. Before we arrived into SLO, it got DARK, I was not used to this, because it usually does not get dark until around Salinas. Between SBA and SLO, my mom went to the Parlour Car for the wine tasting. I stayed in the room relaxing. 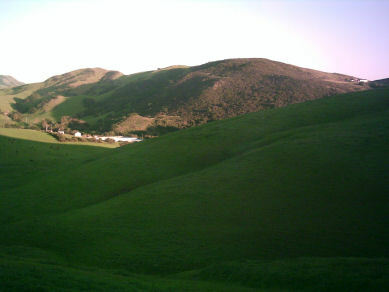 We finally got to SLO at 7:40PM. When we arrived there I was in the Parlour Car. At this time, they made an announcement that the power would go out for a few minutes. A few moments later all the lights went out, and they did not come on in a few "moments". I wanted to know what was going on, so I went to my room and got my scanner and turned it on. I got a new PRO-64 400 channel programmable scanner that replaced my old PRO-50 which only stored 20, so this was a big advancement. I brought my scanner to the Palrour car in my camcorder bag with headphone on. They were saying they were going to turn on the power in a few moments on the scanner, but had not made an announcement. 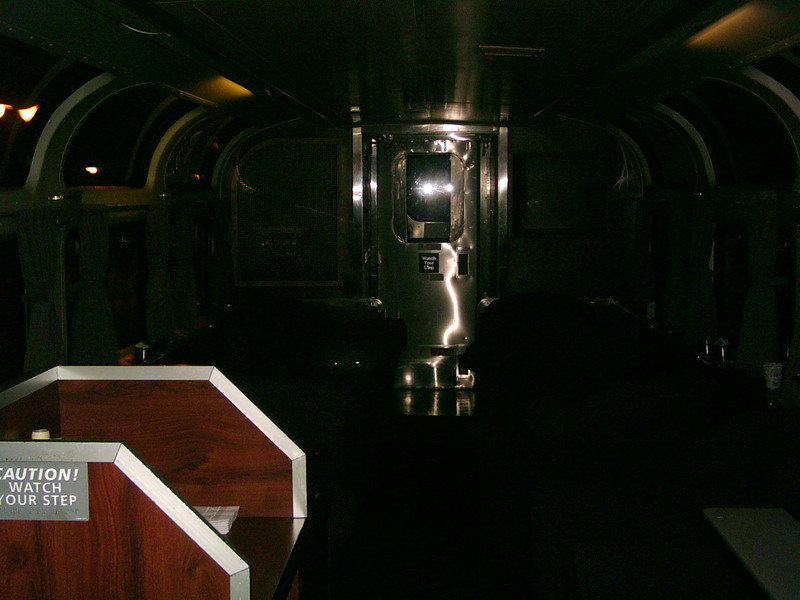 Here is a picture of the Parlour car DARK with the flash on my digital camera. The power finally came back on about 12 minutes later.We departed SLO at almost 9:00PM. We were adding more and more and more time to our lateness. I decided to go to bed around 10:00PM to wake up in the morning nice and early for the continental breakfast and for some pictuers. 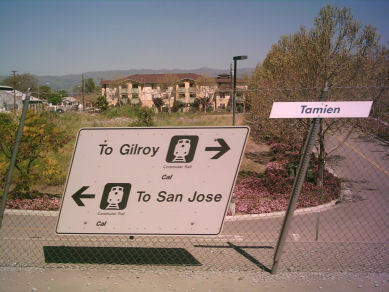 I felt sorry for the passengers that were going to San Jose, Oakland, and Emmeryville since they would be getting off in the middle of the night. I went to sleep at around 10:30PM, our beds were already put down while we were dining. I woke up the following morning at 7:05AM. 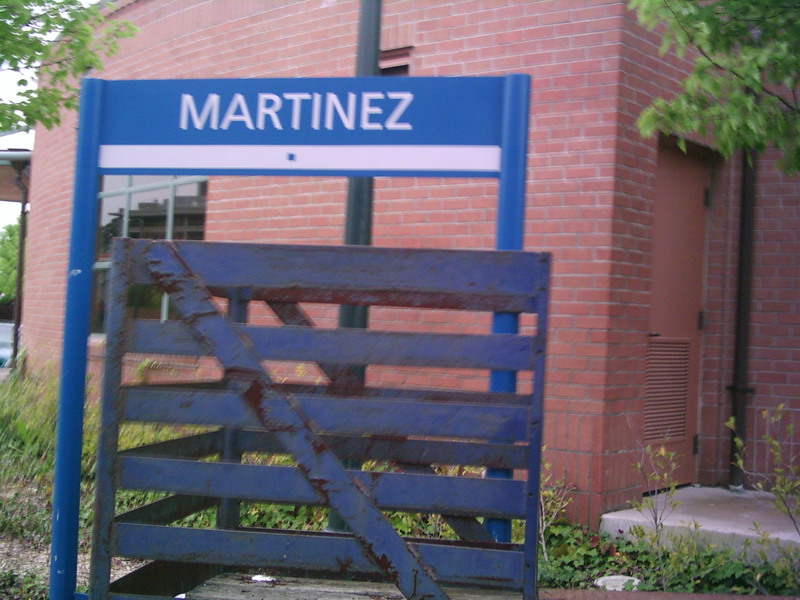 We arrived into Martinez after I woke up. 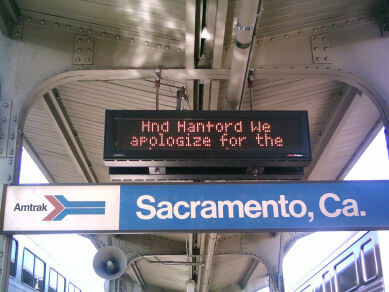 We were not even at Sacramento, we were running really LATE. I went downstairs and took a shower, and then walked to the parlour car for the continental breakfast. At about 7:45AM we were in the dining car having breakfast. As always, I get the continental since I am not much of a breakfast eater. I had Rasin Bran, a biscuit, and Strawberry yogert, and milk to drink. We had breakfast with a man from Montana who was an educator and was connecting to the Empire Builder. (10hrs. late <yeah right>) he told us he took the train because he was in the air force and could not stand flying anymore. There was also a nice woman who lived in the suburbs of Seattle. She was worried about he daughter not knowing what time to pick her up from the train station in Seattle. I offered for her to use my cell phone and she was very thankful doing so. We ate breakfast for about an hour talking about trains, education and other random topics of conversation. We got to Sacramento, after Davis and stayed there for about 20 minutes. We departed Sacramento and arrived in Chico at 11:18AM while relaxing in the Parlour Car. Around noon, we went to the dining car for lunch service. For lunch, as always...I got the Burger with cheese and no bacon. 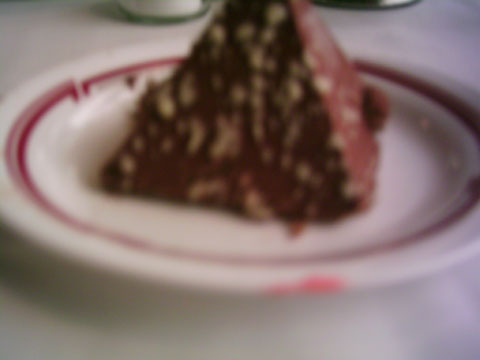 For dessert instead of Cheesecake I decided to try the chocolate mousse pyramid. This was not that good, but it was not to bad. We passed through Redding at lunch. 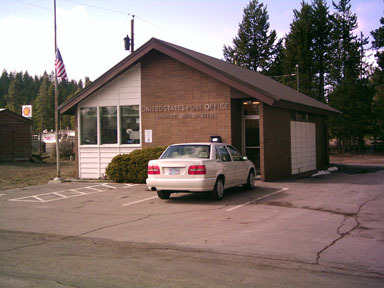 The next station stop was Dunsmuir, CA. 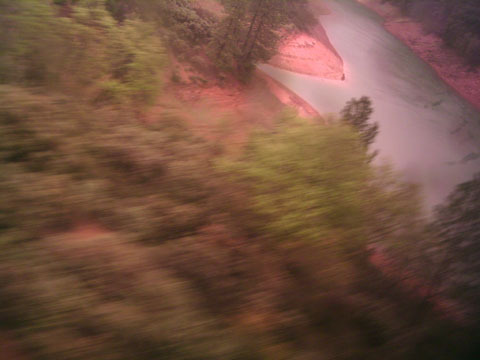 Between Chico and Dunsmuir is my favorite scenary on the Coast Starlight (LAX to CMO). 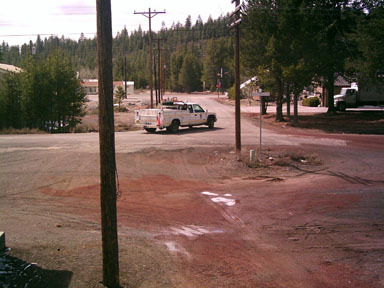 Later that afternoon, after passing through tiny mountain towns...we get to Dunsmuir. 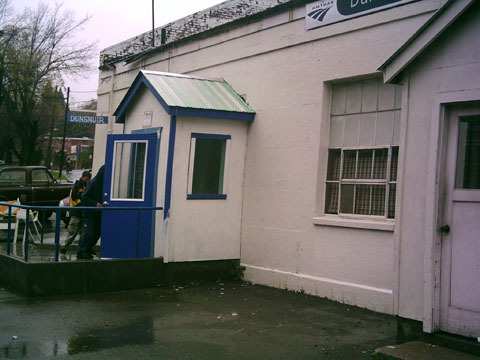 The dunsmuir station is an old small building...which is one of my favorite stations. 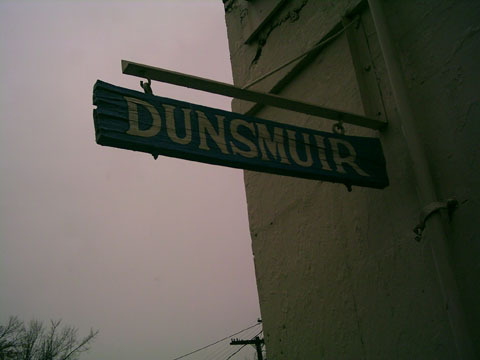 We stayed at Dunsmuir for about 10 minutes because it was a smoking stop. 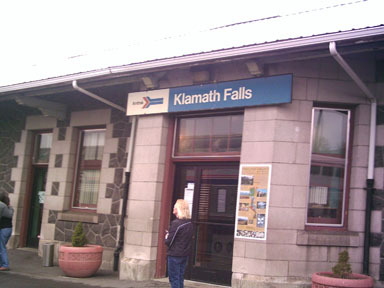 After we left Dunsmuir a conductor notified us that we would arrive into Klamath Falls, OR (KFS) at about 5:15PM. When went back to our room, the LSA in the diner, Chris came around to hand out dinner reservations. We asked for the earliest he had which was a 5:00PM. I usually prefer an early dinner but I would pefer not to miss a 3 minute stop in Chemult. 5:00PM came quick. We had dinner with a woman who was visiting her brother in Oregon and another woman who was traveling to Portland as well. They were both traveling in coach. For dinner I ordered the Medallions again, I had enjoyed them alot the prior night and I usually get the beef dish. My side was a baked potato and I had Italian dressing on my salad. The beef was cooked over medium rare so it was not quite as perfect as the one the prior night but it was still pretty good. My mom decided she did not want to eat another hamburger or steak so she went for the chicken theighs which she complained had alittle to much fat. 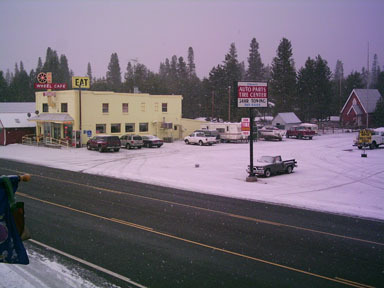 After finishing my dinner and before ordering dessert, we arrived in Klamath Falls. I decided to walk to Car #30 to get out and take a few pictures. After we finished dinner we went back to our room. 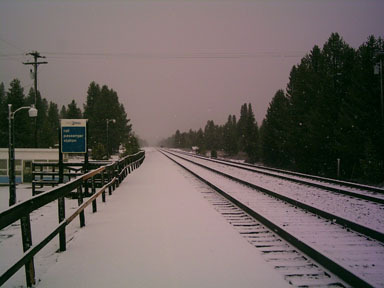 At this time, I called 1(800)USA-RAIL on my mobile and they said 6:45PM ETA into Chemult, OR. About 20 minutes of being in our room, it began to snow! 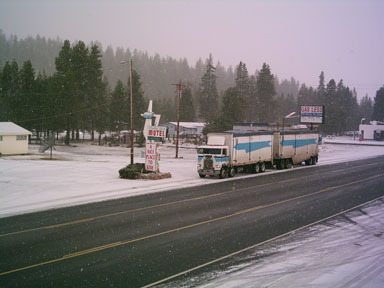 As we went through a forest of trees, I began to see some very light snow with heavy wind falling down. This then stopped, but a bit later it began again! Later, I started to notice the area we were passing through and I realized we were only 10-15 minutes out of Chemult. 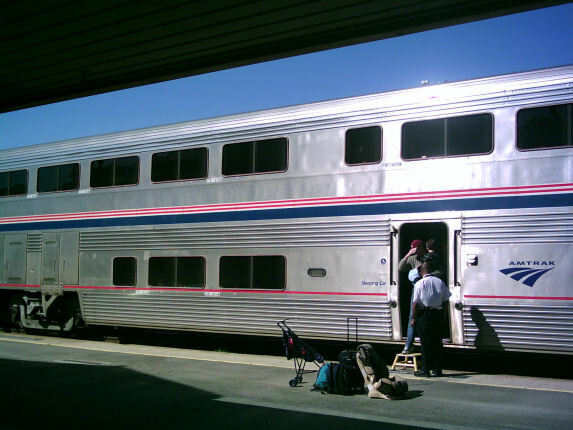 So we grabbed our carry-on and searched our roomette for anything we may have left and walked to the lower level of car 31 to get our suitcases from the baggage rack. After about 5 minutes on the lower level,it began to snow...again, so I put on my raincoat (which by away is an offical Amtrak New Englander raincoat). A few moments later the Asst. Conductor came and began to get ready for the double-stop on the short platform. We were the only passengers in the sleepers getting off in Cemult, so it would be quick. We also asked him about how late the train would be into Seattle since we would be taking the exact same consist the following day because we wereonly spending one night in Chemult. He said the crew would be sleeping on the train most likely and that they would probably be late deparing Seattle since they would be arriving about 3 hours before the 11 departs. While I was video recording the train, a man asked one of the conductors where the Redmon Airport Shuttle was that would be going to Bend. The woman that she didnt know and it should be there soon. Then, I said that it was probably not going to be here until 8:00PM because we were running so late, the southbound train would most likely be using the same bus since there is no way the driver could go all the way to Bend and back in an hour. The conductor then said "ohh I bet thats true". 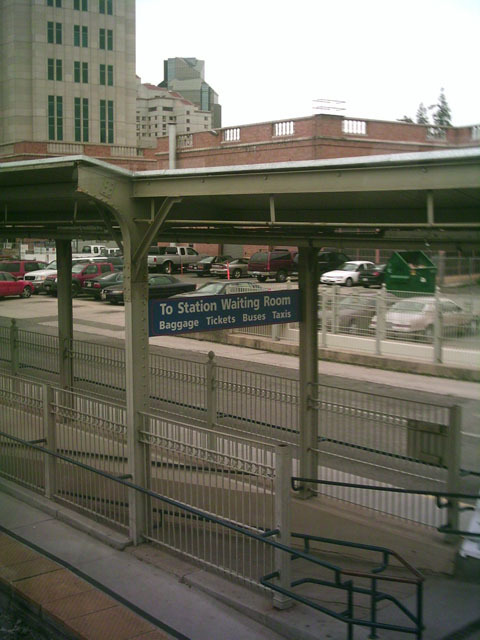 After the train left, the man was waiting there in the cold, so I offered to let him use my cell phone to call the Redmond Airport, I had the number since it was on the back of the Starlight timestable. 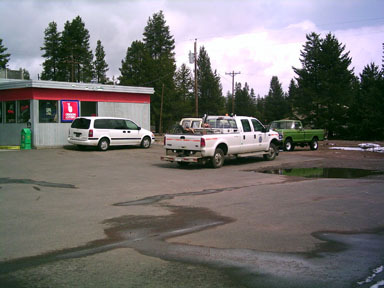 Unfortunetly, tuny rural towns in the middle of nowhere have minimal cell phone reception. So, we invited him to follow us to the Dawson House Lodge (right across Depot St.) to make a call in the lobby. As we walked to the lodge, one of the friendly owners came out to greet us. Inside, Terry got a hold of someone at the airport and found out what was going on, which was exactly what I had guessed. The man thanked us and walked over to the gas station across the street for a snack while he waited for his bus. At this time Pam showed us to our room. We really had nothing to do besides relax since we had already had lunch and dinner on the train with the extra 10 hours. 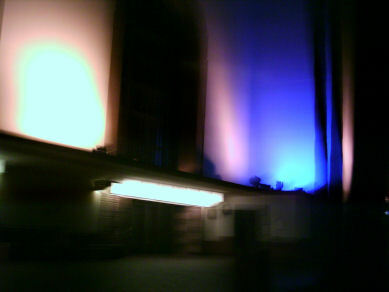 After spending some time in our room, I took a short walk back over to the depot, where the southbound train was excpected that night. 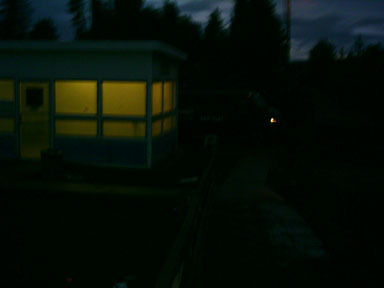 This is a picture of the Amshack at night. I watched TV that night until about 10:00PM then went to bed anticipating a fun day of train spotting the next day. The next morning we eat breakfast prepared by the hotel. They had prepared fresh fruit, scones, orange juice, coffee and tea all for us since we were the only guests that night. After breakfast, it was time for the trains! When I walked outside, it was snowing and it was around 20 degrees. This was not the kind of weather that I was used to So I put on my Amtrak rain cost and walked over to the depot. There were atleaste 4 Union Pacific Vehicles down the line doing track work...there was also a BNSF pickup truck on the BNSF side of the tracks. I did not see one freight train go by the entire time I was there. 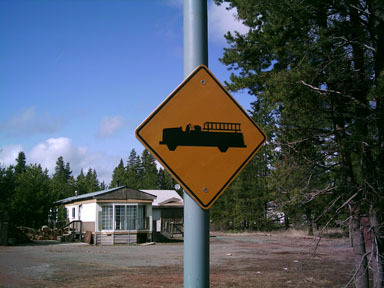 Last year, I did not see any work vehicles and saw several trains. I found this to be rather strange. 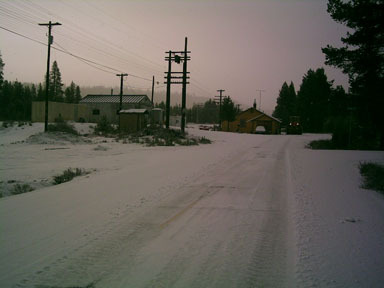 After about 2 hours at the station I gave up and went back to the lodge. I stayed there about a half hour until it was time for lunch. When we walked outside, there was very ltitle snow left...it had melted very rapidly. The Home Run Pizza Parlor (not PARLOUR like on the PPC) burned down over the past year and is in the process of being rebuilt. 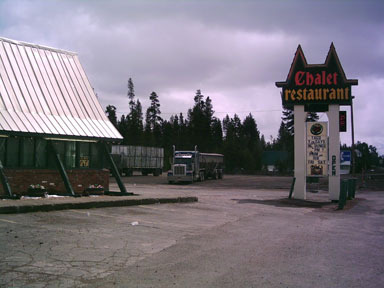 After a short walk we had reached Loree's Chalet, our facorite restaurant in Chemult. 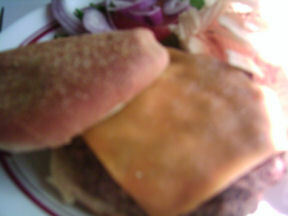 Inside, I oredered the Cheeseburger and my mom had a BLT. 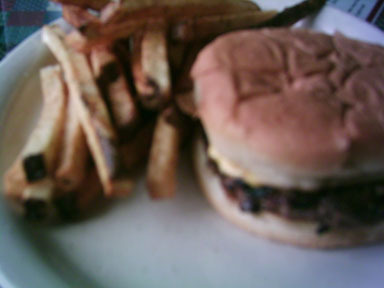 The cheeseburger was really good and it came with those tasty fries you cant get in California. 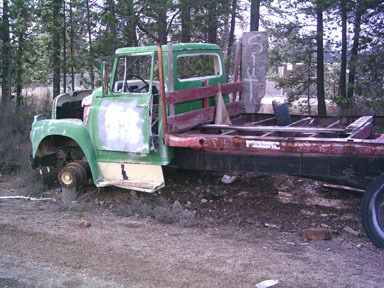 After lunch on out way back to the lodge, I saw a UP truck broken down on the highway with a Chemult Auto Towing truck next to it about to take it away. Right after that, I heard a train coming...it was the northbound 14 only three hours late. I ran over to the depot to get some pictures. I did not get any video. Notice the Cascade locomotive at the front going north to Seattle. 14 is off to Eugene and the Bus is off to Bend. Now, most of the workmen are gone as well as the Amtraks...There was not much going on at the station...so I was hoping a freight train would come by. We waited about an hour and none came so we took a walk along Depot St. There were some UP buildings and equitment next to Depot St...I had not noticed these the prior year. Another sign on the left, and a brand new Ford F-150 on the right. 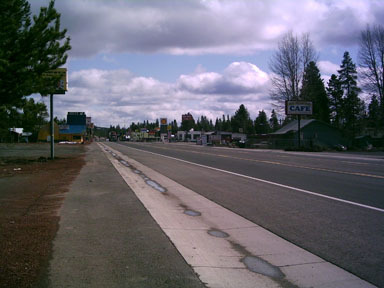 After about 2 hours I decided to walk alittle around town on the side of Highway 97. 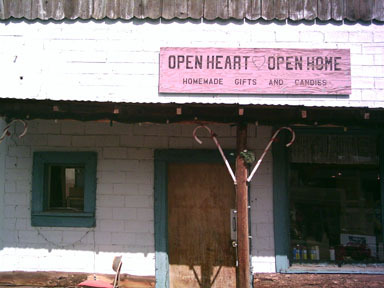 Center: This store was one of the first buildings in Chemult and was a general store in the early 1900's. Then, it turned into a gift store and unfortunetly is now closed. The end of town...Ahead you can see a sign that says "DO NOT PASS". The phone booth to the right has the same paint scheme as the Amshack...I would assume they were made by the same company. 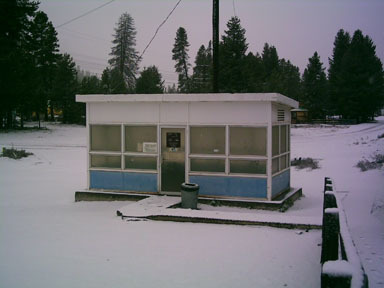 The Chemult Amshack has other identical ones in Pendleton, OR. 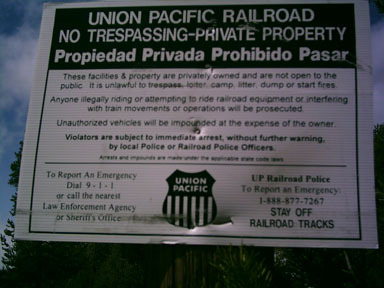 On the way back I see some of the Union Pacific equitment through the bushes on Highway 97. When got back to the Lodge we relaxed and checked the train status of the train...It was running later and later. 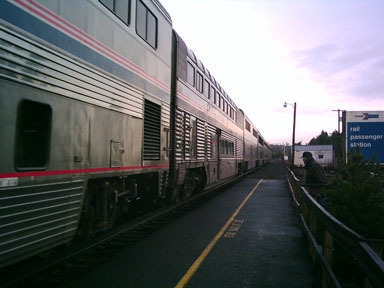 A bit later, Pam, the owner of the lodge notified us that we would have to switch rooms since we were staying after the check-out time because of the Coast Starlight's later and later arrival of the southbound train. 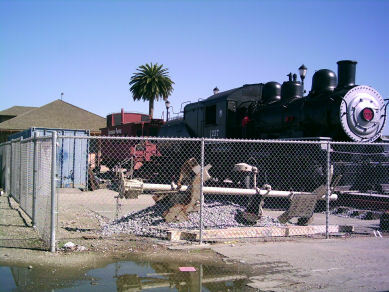 A bit later, I saw Harry, who was Pam's husband and asked me if I had found any railroad artifacts, I said "no" and he told me he had one around the back. It was an old railroad "hammer" for putting spikes down. 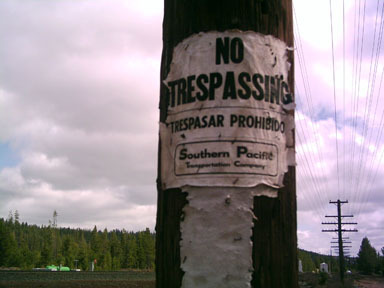 He said he had recently found this along the side of the SP (or UP I should say) tracks. 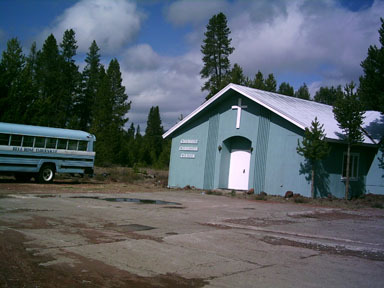 He told me that I could have it and I was very thankful, then he offered to take me on a walk into the Winema Nat'l Forrest which is right on the other side of the tracks. He told me of some old railroad tracks which were used to haul wood from Chemult. Now, the steel was not there, but the wooden ties remained. I had no idea of this so I was looking forward to see it. 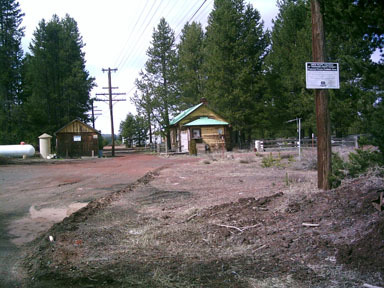 He got his dogs, and we walked just a few minutes over the tracks and he also explained that there were some old hobo camps in the forrest where you could see old pots, bottles etc. Soon he showed me the old wooden ties that he said if you bring a metal detector you can atually find old railroad nails with the year they were put in on the top. 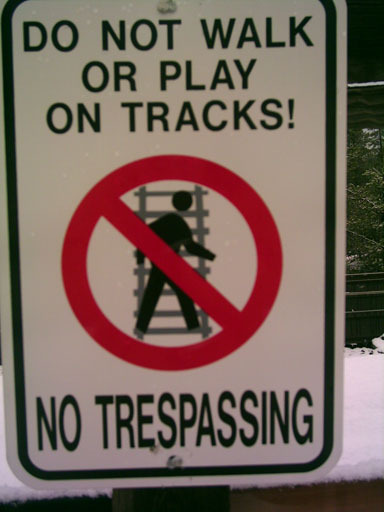 I had no idea of these old, old tracks and I wish I had explored this before Harry informed me. After a 15-20 minute walk, we went back to the lodge and he told me to meet him in the lobby to give me a nail. He gave me a "55" railroad nail which was exactly 50 years old. I was grateful, and I think I will try to bring a metal detector next time im in Chemult! 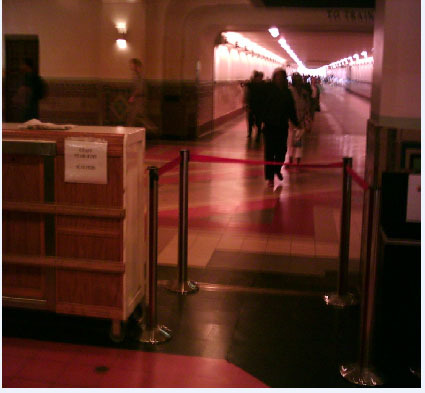 It was now around 5pm and we began moving our bags down to a smaller room from the largest room that we were in. We got there and decided to have dinner around 6:45pm. We relaxed until dinner watching TV. At about 7:00PM we walked down to Loree's Chalet to get dinner. 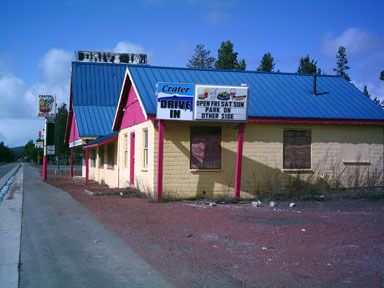 It was not quite dark yet, and the highway was not to busy.We get to Lorees and I have a shirley temple with a 14oz New York Steak. It was cooked up to perfection and for dessert I split a cherry cheesecake (not quite as good as Amtrak, I wish they had strawberry isntead of cherry). 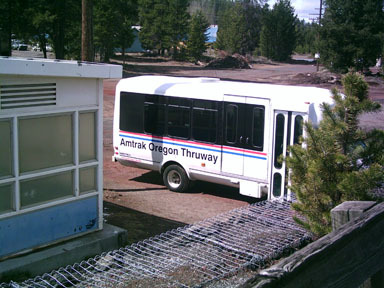 After we were gettting ready to leave, the Amtrak Oregon Thruway Bush pulls into the parking lot of Loree's Chalet! 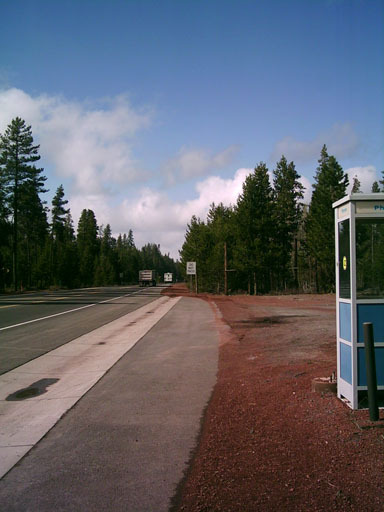 John was the driver, and he told us that he would be at Loree's for along time, he used a payphone to call 1-800-USA-RAIL and they said the train would arrive at 11:30PM. He told us he could pick us up at the lodge with our bags and he would be at the station if we wanted to stay warm inside the bus instead of the 25 degree weather. By about 8:20 we are back at the lodge relaxing...My mom goes to the lobby where the other people have checked in. The lobby is nice and toasty with a fireplace going. At 9:00PM I watch "24" until 10:00PM. I call Amtrak, and actually speak to an agent, she tells me that this is an "unusual delay" and the train was no estimated to arrive at 12:30AM. 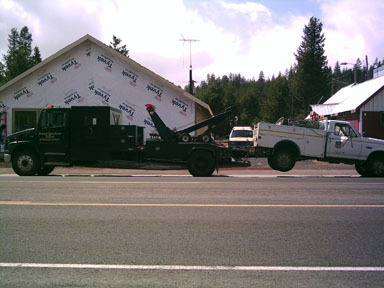 It had arrived in Eugene, and would be going through the Cascades until it got to Chemult. Finally around 1:00AM we decide to walk over to the station, after about five minutes John (Shuttle driver) arrives with about 10 passengers coming in fron Bend and surrouding areas. He invited us to stay warm inside of the van which was very nice of him since we were not passengers aboard the van. He told a few jokes to everyone, then he got a phone call from the conductor asking how many he had in Chemult, he then asked if anyone was going Sleeping Car, we were the only ones, so the train would make a double-stop for us. In about 10 minutes the train started coming, I got out to video record it. 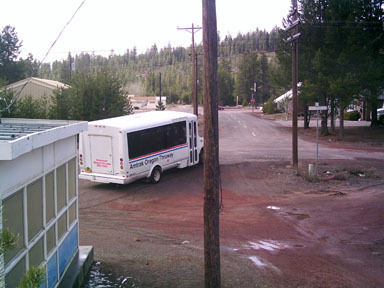 -Video in VIDEO SECTION: "#11 Arriving in Chemult 2005"
The Conductor opened the doors of car 31 since all the attendants had obviously called it a day, and would not stay up for a small stop like Chemult, Oregon Pop. -300. He shows us to our room and explains where the dining car is, even though we knew...we thanked him and then went to sleep, to try to get as much sleep as possible because I like to wake up around 6:30AM on trains (Breakfast time). The following morning, we are still running about 4+. I did not wake up until about 7:30 becuase I just couldnt do it with 4 hours of sleep. I immediatly go downstairs to take a shower and go eat. In the Parlour car, I grab a few muffins and eat them in the dining car with the Continetntal, which included Raisin Bran, a biscuit, and strawberry yogurt. While eating, we arrive in Chico, we depart Chico at 8:32AM. 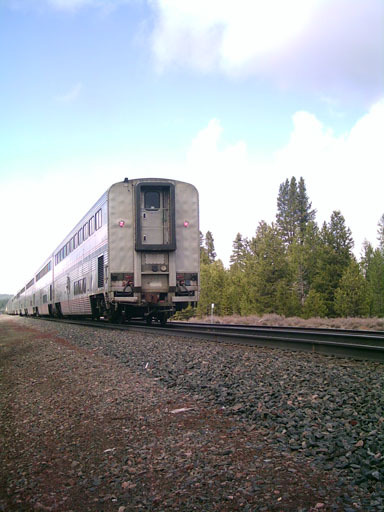 I also recall an anouncement for California Zephyr #6 passengers to detrain in Sacramento to catch this train. After breakfast, I have a good cell phone signal, so I call 1(800)USA-RAIL to find out how we were doing. The report was 4hours, and 46 minutes. Julie also estimated us to get into Los Angeles at 10:46PM, but that was not going to happen! After a few more delays due to freigh traffic, we arrive in Sacramento, I did not see the Zephyr, but I did see one Capitol Corridor train. We stayed in Sacramento for about 20 minutes. The next stop was Davis, CA . We arrived in Davis shortly, and only stayed there a few minutes. 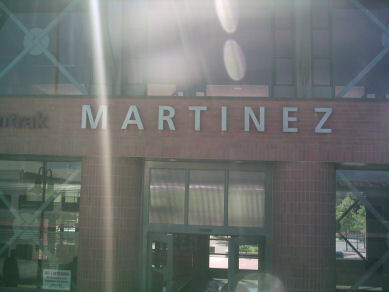 Then it was Martinez, another one of my favorite California train stations. By 11:50AM we are off to Emmeryville. In EMY, we go have lunch in the dining car. 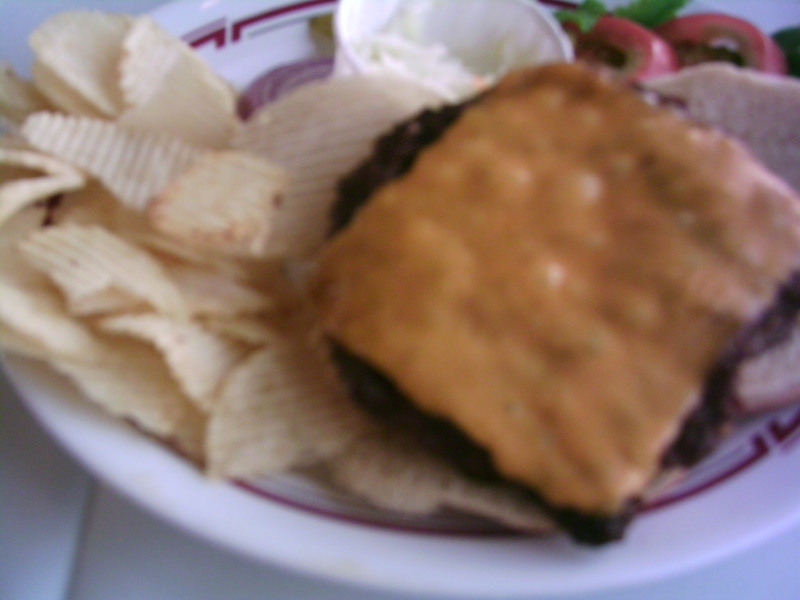 As usual, I have a Cheeseburger. 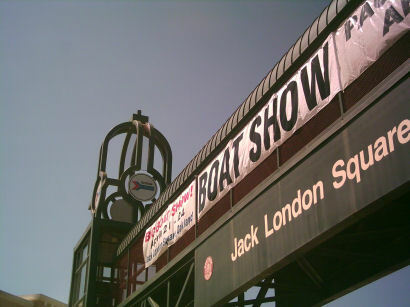 Then we get to Jack London Square after that! About 15 minutes later, San Jose. 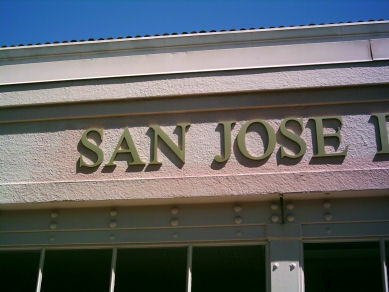 San Jose is a familiar stop since it was where we got off the very first time I rode the Coast Starlight a few years ago. After SJC, we went through a small commuter station, Tamien. 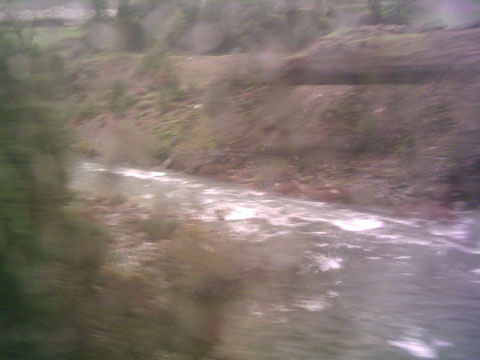 At this point, I relaxed in our roomette until we would get to Salinas. 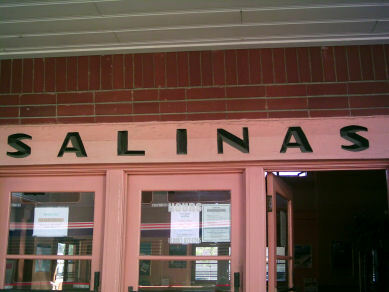 Salinas would be the last stop before Paso Robles, it will take about 3 horus to get there. So I go to the Pacific Parlour car and enjoy the scenary. We had very few delays, and it seemed like we may be making up some time. Paso Robles came at 5:50PM and we stayed for a rather short time. 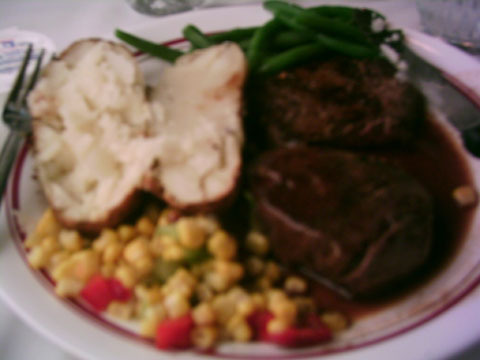 Then it was time for dinner, in the dining car I had a steak, with baked potato, and salad. 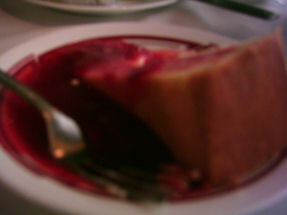 The steak was cooked up to perfection, for dessert I had the strawberry cheesecake. Not to much later, We got to San Luis Obispo, now as on the way up you remember about the 1 hour delay with the power shortage. This time we were there for about 25 minutes waiting for a freight train. We also got a few new conductors onboard. We finally leave and the new conductor makes an announement that we will be getting to Los Angeles between 1-2am. Obviously Julie's estimate had gone up in smoke. 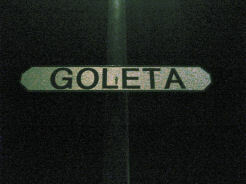 She also tells us that we will be stopping in Goleta, CA (near UCSB). This is not on the #14/11 timetable but we would stop there anyway. Until we got to the SBA area, we went back to the room to relax. We also realized that we would have to take a Taxi home since it was so late. 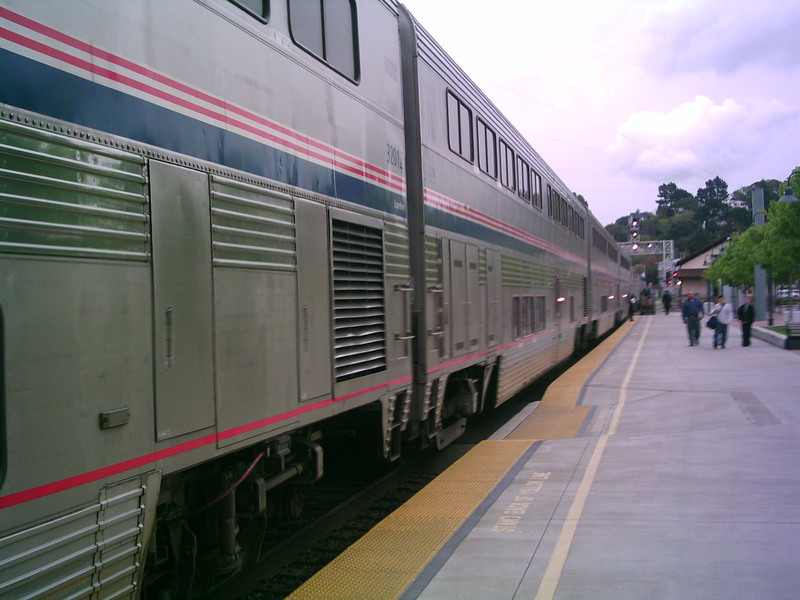 10:45PM-In Goleta, The train would only open the doors in coach, so I walked to the first coach after the lounge to detrain, the coach was rather smelly, although it did not have that many poeple still aboard. 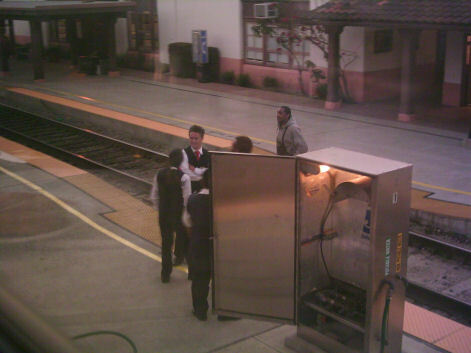 We were told that there was going to be a brief inspection of the train by the mechanic there in Goleta. 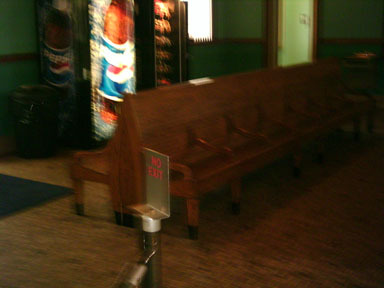 This would also be a smoking stop instead of SBA to try to save 5-10 mintues. 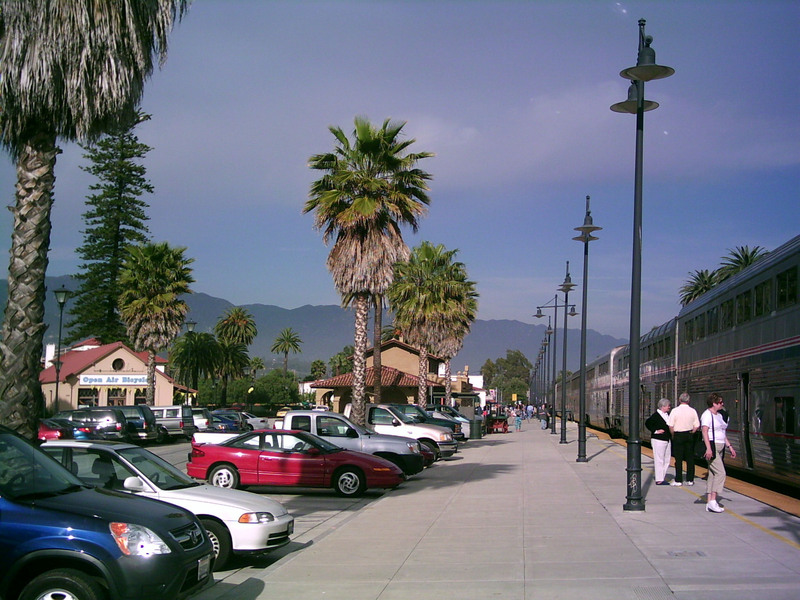 A few people actually got off the train for good in Goleta, the rest were just getting some air or smoking in Goleta. Then, the power goes off inside the train, again! The conductor said it would go on in a minute though, and it did, a few moments later the green light went on (brakes released) and we got an "All-Aboard" to highball Goleta. 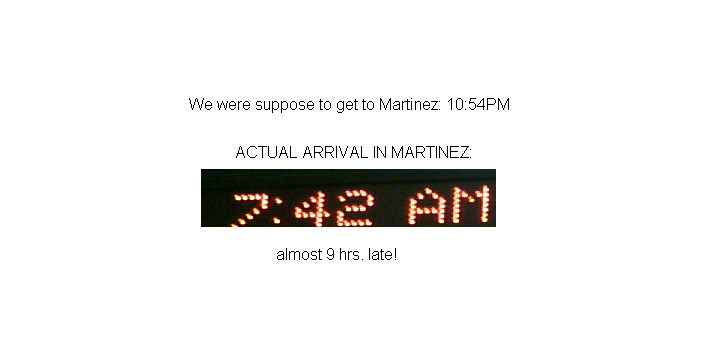 In about 8 minutes, we were in Santa Barbara, we were in SBA at 11:32PM. This was about a 4 minute stop until we proceeded to Oxnard. 12:20AM-Oxnard for about 3 minutes. I then took about a 20 minute nao through Simi Valley. Around 1:45AM, we had arrived in Los Angeles. 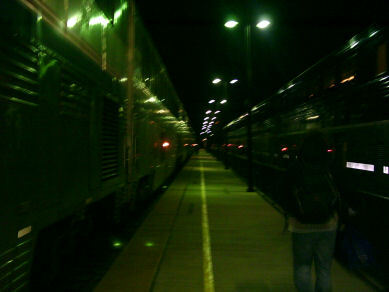 My 2005 long distance train trip was over. We got a red cab to the Taxi area and took a taxi cab home. I was glad to be back in Los Angeles, but I was still very sad that the trip had gone by so fast. 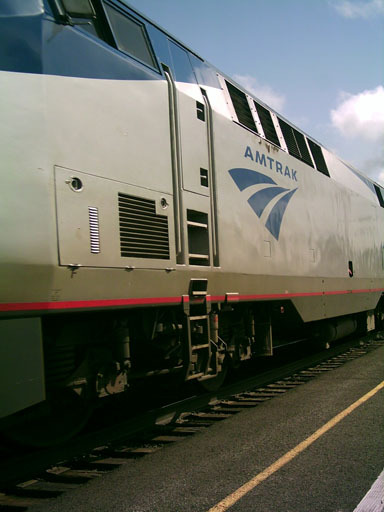 I look forward to my next Amtrak trip, and I intend to ride to Coast Starlight to Northern California this summer to visit relatives, and to ride to Capitol Corridor for the first time. Thank you for reading my trip report, be sure to check out my videos that I will be psoting on the site within a short while. 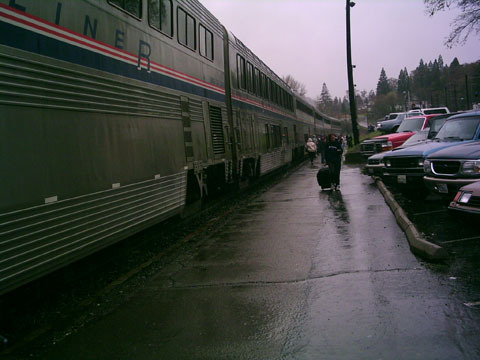 PS: The last year between my frirst long distance trip and my most recent, I have began to collect Coast Starlight product line merchandise...Check out some of my Amtrak Souvenirs: Click Here! PLEASE SIGN THE GUESTBOOK AS WELL!